The strict protection relies on the utter and permanent relinquishment of human being interference in the state of ecosystems, creations and nature elements as well as in the course of natural processes in the areas of this protection category. Within the borders of the Slovinski National Park, with the strict protection, there are comprised 12 areas with the elements of its peculiar flora and fauna, unique biocenosis or biotopes as well as landscape features. The Łebsko Spit constitutes the main protected object, which creates the complex of unique geomorphologic forms of beyond regional scale as well as the venue of natural rebuilding processes of the sea-side shore of a great dynamism. 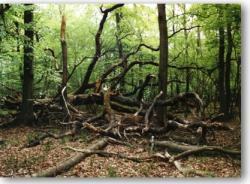 There occur here valuable woods assemblages, non-woods as well as water ecosystems. The total acreage of the protected areas numbers 5 928,93 hectares. Each of them has its proper name and determines the most significant protection object.